Discussion in 'BMX & Dirt Jumping' started by grom-dom, Apr 26, 2008.
are dope, but slow. i've been diggin at my house a fair bit, getting stuff done. got 12 cubic yards of dirt coming monday, should be word. not sure if the berm is staying or not. gonna be a lot steeper if it is. first jump is gonna be a left hip. lip is about 4' and change, lander is gonna be around 5'. that's going to flow into a right hip of roughly the same proportions, then god knows what. there's eventually going to be a right hip step up box into the berm and there will be a 6' quarter at the end of the line, wherever that will be. 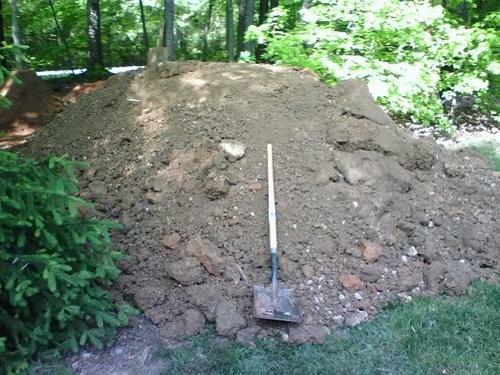 i'm getting 12 cubic yards of fill dirt/clay delivered monday, so expect a lot more pretty soon. **btw** this is my first time building trails from scratch, so help is greatly appreciated. looks nice, keep us updated on the progress. Looks like you've got great dirt to work with. What's the point of the milk crates? Why bury them in the jump? The dirt will just go through the holes and fill the space, so it's the same as not having anything there at all. 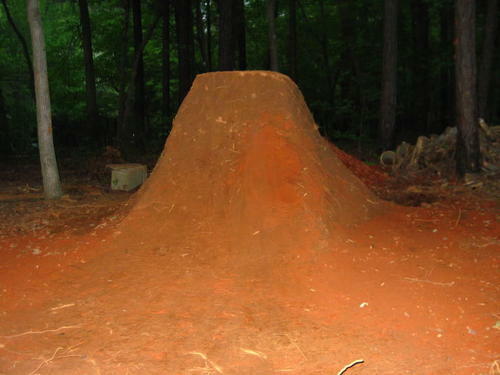 When I build jumps I usually bury logs. But anything solid will do... get on craigslist free and find a washer and dryer to bury. Huh? Try taking the extra 2 hours and just use plain dirt, instead of garbage. Oh yeah, killer work on your trails. Lip looks way skinny, but if you are the only one digging, do what you gota do. Lol A Washer And Dryer?! 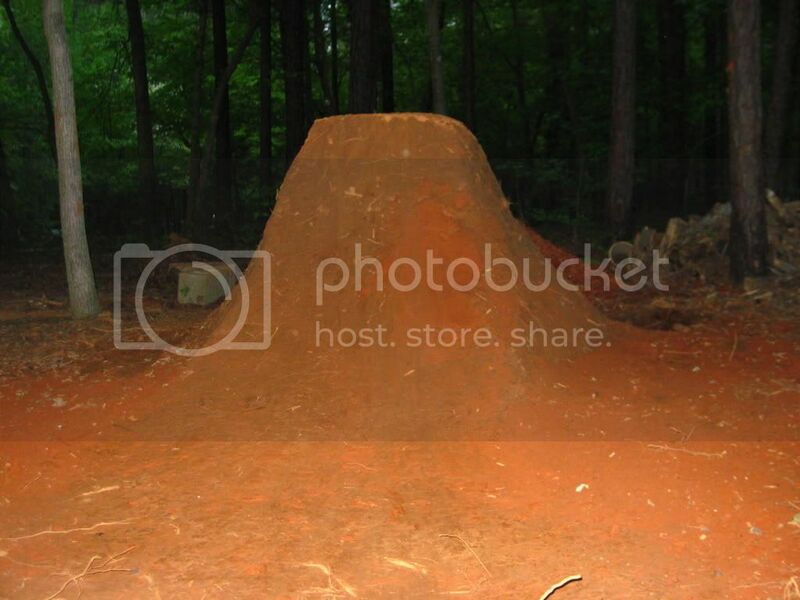 I belive the milk crates provide a solid base for the jump and help hold the dirt together. I think the crates could be trouble. Especially with a lip that thin, you get a real big dude hitting that thing as speed, and it might just tip it over. I'd be worried about the dirt eventually sifting into the crates too. I'm gonna second the washer and dryers. 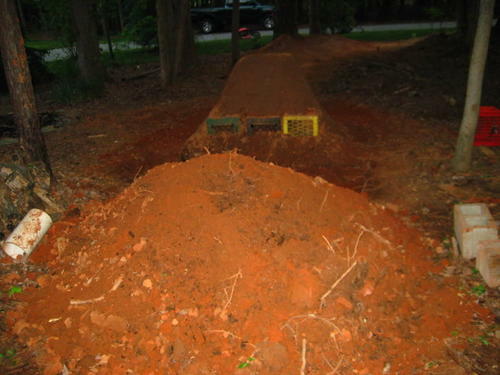 When you dig by yourself you can make big jumps by hand in a lot less time if you bury stuff. Logs work good as well. When I was in college my parents were cool enough to let me build trails along the side of their house. My stepdad and I went out on big trash day and snagged every fridge, washer, dryer, and freezer we could find. 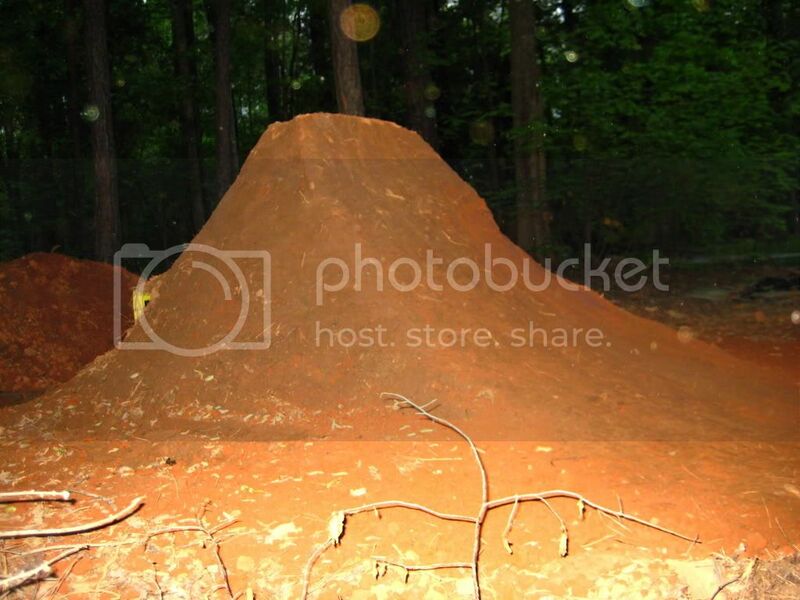 Dig a hole, drop it in, then make the lips and landings out of dirt. Honestly, it makes sense and we never had any issues. Once you get older and have the use of excavating equipment, that makes things easier, and perhaps burying things won't be needed. Also, once you get a crew that will help things as well. But, for the time being, bury away. Heh, I was kind of joking about the washer and dryer, but now that I think about it... why not? My point was that he should bury something that the dirt won't go right through. If you use milkcrates, you might as well bury them right-side up, with the opening on top! looks really good. and using random crap as filler for jumps works great. if you dig alone/have crappy soil then why not? my friends and i recently started diggin at a new spot that is basically hidden in an abandoned railroad yard. i gathered a few big railroad ties to use for the landing. worked well, but the spot needs a lot of work. i likes. all i need are a couple in the yard and i would be stoked. keep it up and keep learning. the 9th street trails in austin have a jump called the Maytag. I threw a refrigerator into a landing once. That jump is now known as refrigerator perry. threw some dirt again today, rained a bunch so mainly patching stuff up and facing the rest of the launch. added a bit more width to the lander, but i need to wait for the dirt to get delivered to finish it. i f*cked up on the lander and built it to far to the left. just take the dirt from the left and throw it off to the other side? If it is already out there putting something under the jump makes sense, but if you are actively going out to get trash and bury it time to look in the mirror and maybe cut that mullet. Man, if I totally respect both of your perspectives, and for sure I see the point of using pure dirt, heck ya it makes more sense. BUT.... if you lack the man power and want to get from point a (building trails) to b (riding them) sometimes I think its forgiveable to "cheat" a little. Now implying that my parents place was a little WT I think would be rather disrespectful. Regardless of how it sounds my jumps were clean and super fun. Appliances were covered and it was super nice being able to walk out the door and be able to ride my bike. Lol, it was really convieniant when one morning I broke my leg I could drag myself into the house and my mom to help me. I guess there is a progression of how you build jumps, and the starting point is usually hucking off a ramp made of a board and a milkcrate (or something). You make your first little bumps, maybe bury some stuff (heaven forbid), and eventually get to a point where you can either have a crew to help build or afford to have equipment to assist the job. Regardless, you have to start someplace and I commend Grom (and any other builders) for making the effort to even make jumps instead of roaching off of everyone else (or even worse, not even riding). 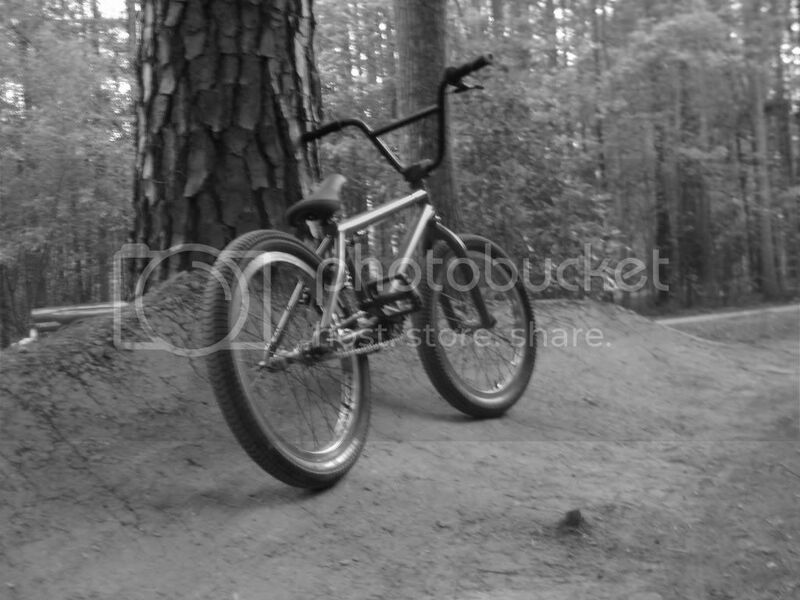 So, hats off to anyone who has ever picked up a shovel, made a pile of dirt, and hucked themselves off of it, because when the day is said and done all we are trying to do is have fun on our bikes. I'm right there with ya. I'm helping our city rebuild the local public trails and know in I only have to pack and shape and they bring in loads of top soil and move stuff around with skid-steers and big ft end loaders makes the task much less daunting. 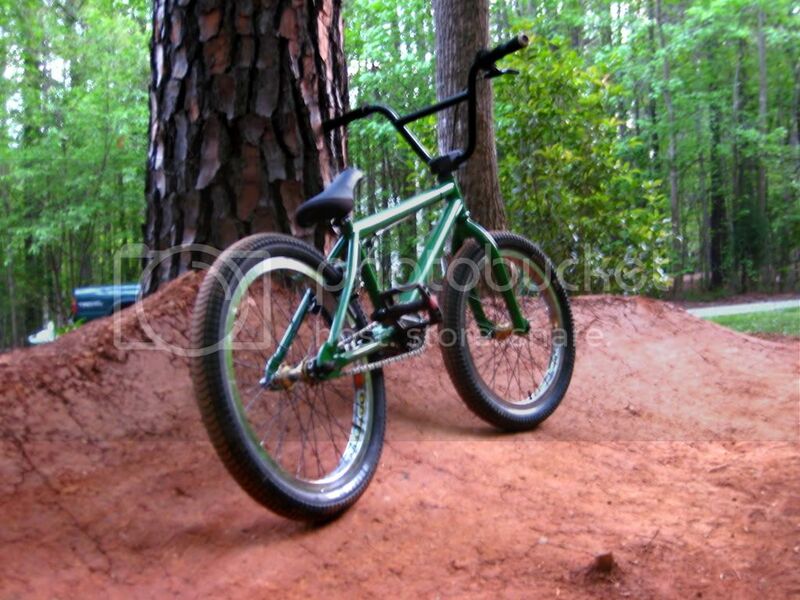 Granted, I will be the ONLY one out there packing and shaping, but at least I will have a place to ride. And for the record there won't be anything but dirt under those jumps, but considering the situation, why would there be? yea, I feel the same way. If I use any random objects when building trails it's to build a frame that helps shape the jumps. 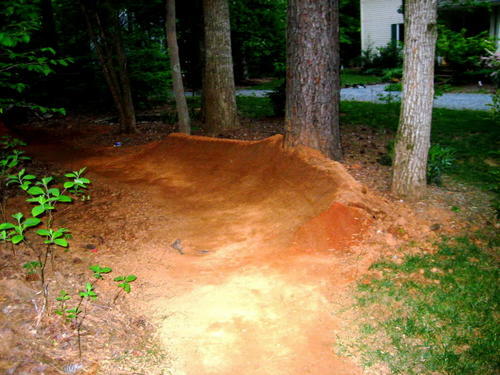 Theyre on the sides or on the back, and when the jump is packed and dry I pull the objects away and I have a jump with no crap in it, plus I didn't have to throw so much dirt. granted I usually have to do some more shaping after I pull the logs off. 4:30 today. tearing out what i have when the dirt gets here. Don't need more than a tire width. You mean like.......at a phish concert? 14 cubic yards i think? gonna do hella shoveling this weekend. Ya, my buddy had a couple loads like that dumped at his place as well. When it was all packed and done we had a couple smaller doubles, but at least is something to start with. my shredder bro john came over to dig today and we got some stuff done. zach, i took your advice, and your ocd is no longer a problem nothing sticking out, no milk crates, and it's a solid 2-3 feet wide. shoulder high. sooooo good. gonna knock the lander out this week i hope. school just got really busy, so progress will be delayed a tiny bit with exams, end of year projects, papers etc. it's ridiculous. pics tomorrow though, it's dark. 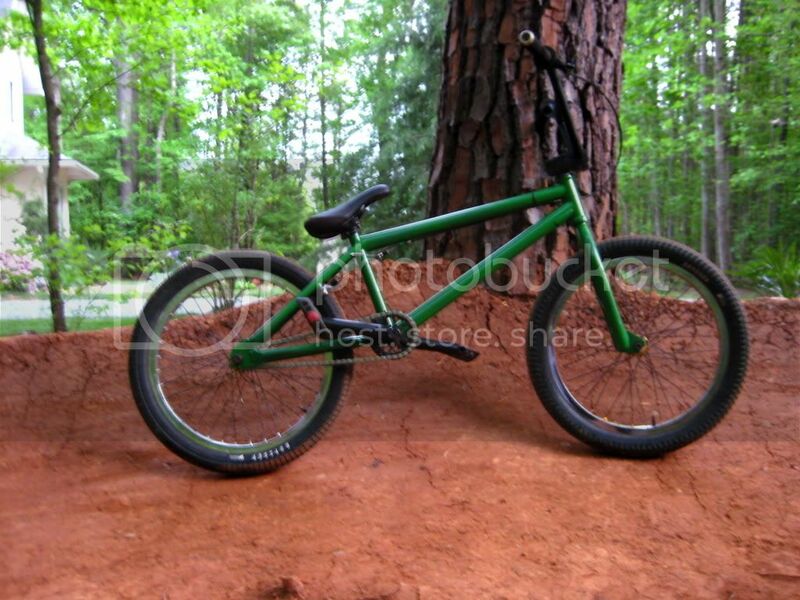 should be ready to shred by summer with hopefully lights and a couple lines. having running water, and access to electricity, food etc right there is so dope. i'm snagging our old generator when my dad gets the new one i think. some construction floodlights in the trees. should be good.